Scrap-a-Doodle-Doo: Why should you shop at a Local Scrapbook Store (LSS)? Why should you shop at a Local Scrapbook Store (LSS)? Sherri Caramico back again for my 2nd post of the week! The Design Team at Scrap-a-Doodle Doo is going to be taking turns posting on "THE DOO's" blog ( as we so LOVINGLY call our favorite LSS) from now on. We are going to post twice a week, on a rotating schedule. Be prepared to soak in lots of inspiration, techniques, class info and ideas, as we have LOTS we want to share with you in the coming weeks! First of all - there are not many LSS's around the Northern NJ area - and we creative people NEED them for all they have to offer. Yes, you can get "some" of the products that LSS's carry at "BIG BOX" Craft and Hobby Stores - but it really isn't so much about what you CAN get at those chains that are up and down every highway, as what you CAN'T get at them. LSS's pride themselves in Customer Service - and there is NO BETTER Customer Service to be found ANYWHERE than what you will find at "THE DOO!" This is a true family run business, and one of the owners is usually either in the store - or just a phone call away. They are always friendly and helpful in any way they can be, offering ideas, suggestions, even a shoulder to lean on, or a kind listening ear. LSS's continually get in the LATEST, GREATEST, and HOTTEST NEW PRODUCT - The inventory at Scrap-a-Doodle Doo is always changing. Stephanie and her Team just placed huge orders for NEW PRODUCT just released at CHA! They often have direct contact and relationships with many Scrapbook Companies too. Did you see something on line that you want to purchase? Check with THE DOO first before you do - Stephanie will gladly special order it for you if she is able. LSS's offer Classes where you can learn new techniques and create interesting projects. The DOO's scraproom provides a comfortable creative environment, where their experienced staff of teachers offer classes and allow one on one interactions with students because of the cozy class size. ( usually a maximum 12 -average class size is 8-10 ) I personally LOVE teaching a THE DOO, and enjoy helping people to reach outside of their comfortable scrap style and try something new! LSS's offer Scrapbooking Kits for Scrappers of all levels. Most include color photos and complete instructions. If you are unable to make it to a class - why not consider purchasing a Class Kit? Also THE DOO offers "Kits of the Month" that include coordinating product, instructions and photos to create (2) Two Page Layouts with extras. These kits are a great deal, but are limited in quantity, so if you are interested, be sure to order one while they are still in stock! LSS's offer in store crop space. Need a place for you and your friends to get together and get crafty - Check out a No-Frill's Doo In-Store Crop - offered on some weeknights and weekends. Are you an individual scrapper? ( the only one of your friends who loves to scrap?) Well then, if you attend a DOO In-store or Weekend Crop and you'll meet lots of new and friendly people too! LSS's offer weekend crop retreats. What better way to get lots of scrapping done, and give yourself some well deserved "YOU TIME" then to spend it with a group of fun, crafty women, creating and laughing together - all while being well taken care of by Stephanie and THE DOO CREW in a beautiful hotel setting! You can virtually scrap from 11am on Friday - to 3pm on Sunday if you wanted too! Each event is Themed, and always lots of FUN. Classes are even offered during the weekend events, as well as opportunities to book massages, reflexology, and FREE Raffle prizes and goodie bags are give out too! LSS's offer a place to meet new and interesting people. They are a place to find new friends, and new ideas, a place to ask questions, get suggestions and bounce off some ideas of your own. They are a place for us to get our creative release, to share our stories, and to cherish our memories, and even make new ones. I am so thankful and grateful that Scrap-a-Doodle Doo provides all of these WONDERFUL things for so many people, and I feel blessed to have met - through THE DOO, so many lovely, fun and talented people, who I am now honored to call my friends, especially Stephanie, Mama Doodle and Mark, who work so hard to keep this LSS the FANTASTIC place that it truely is. So, next time you need a scrapbook supply for your project, or stash - please think about all these reasons why it is SO IMPORTANT to support your LSS, and kindly consider making your purchase at SCRAP-A-DOODLE DOO - either in person, or even On Line - as they are virtually open 24/7! Please become a FOLLOWER of this BLOG, and kindly "LIKE" their Facebook PAGE, so you can keep informed of all the FUN things "THE DOO" TEAM has in store for you! Gotta LOVE The DOO! ~ I "DOO" Do You?!! 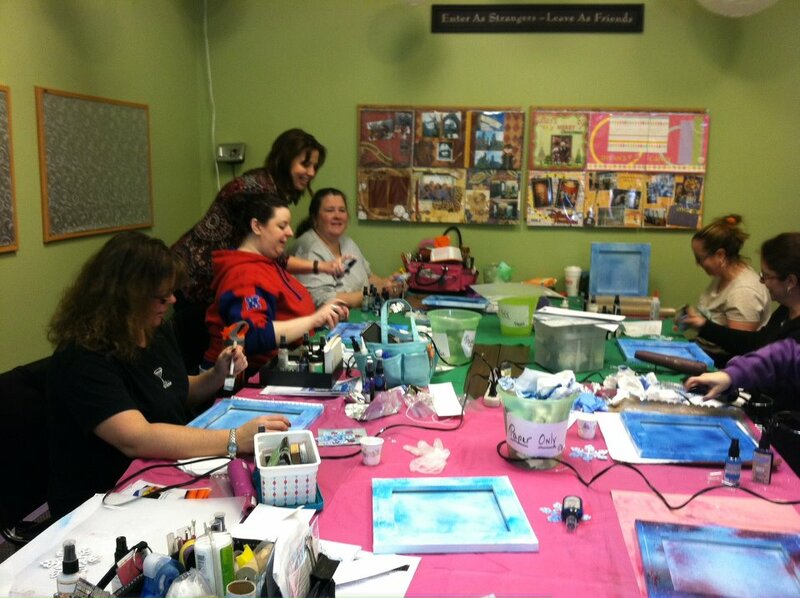 Here is a photo from the class I taught last Saturday - it was LOTS of FUN! Sherri ... thank you SO much for the incredible and unsolicited write up that you posted on the blog today! You brought tears to our eyes! We, too, are truly grateful for friends like you who we have met through this wonderful hobby! Ours is a collaborative effort. We feel fortunate to be surrounded by so many people who give generously of their time, their talents and their moral support to make our classes, weekend retreats and store atmosphere such a pleasure! LOVE Scrap-a-Doodle Doo! Best LSS around for sure! I have missed you guys so much but this post reminds me I must pay a visit soon, I had so much fun at the last retreat. One thing is certain, Stephanie and Norma always have fun things going on. Thanks so much for the reminder, hope to see you all soon!!! !